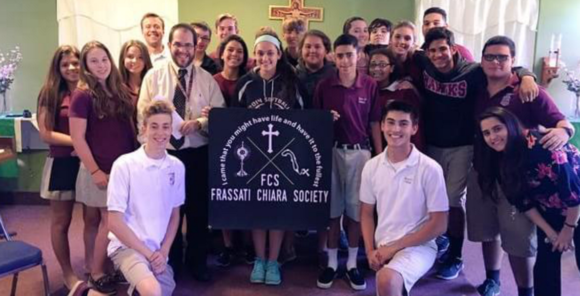 Santa Fe Catholic High School Campus Ministry works to embrace God, who is love, and to model Jesus’ example of service and leadership, by humbling ourselves to the point of self-sacrifice and passionately sharing Jesus Christ with the Lakeland Community. We believe it is imperative in our ministry to meet people where they are in life and to love them, not judge them. SFC Campus Ministry honors and values the differences of personality, interests, gifts, and passions in each student, faculty, and staff member. Our program offers a wide range of experiences and learning opportunities so that everyone has an opportunity to encounter Jesus Christ and hear his Good News. These opportunities include retreats, events, pilgrimages, mission trips, service work, spiritual direction, Sacraments, spiritual formation, praise and worship, music and media.